Act quick to snap up this mid-range headset for an absolute bargain, with a 67% reduction—the deal ends today. If you're in the market for a gaming headset and can't part with too much cash, then this here deal might be just for you. Logitech's G430 gaming headset is down to its lowest ever price in the UK at just £22.99 over at Amazon. However, you'll have to be quick to take advantage of it as the offer only runs until midnight tonight. Act quick. 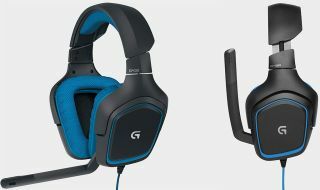 Logitech has a load of headsets for gaming, one of which is on our list of best gaming headset around right now, so you know that it can be trusted and that there's gaming pedigree to be taken advantage of. The G430 won't match the big boys of the market but it is a solid middle-of-the-road headset that has some very attractive features such as 7.1-channel Dolby surround sound, DTS Headphone:X support, on-cable controls, rotating earcups for easier storage, and an adjustable noise-cancelling microphone. All of this and for just 23 quid? That's a steal.